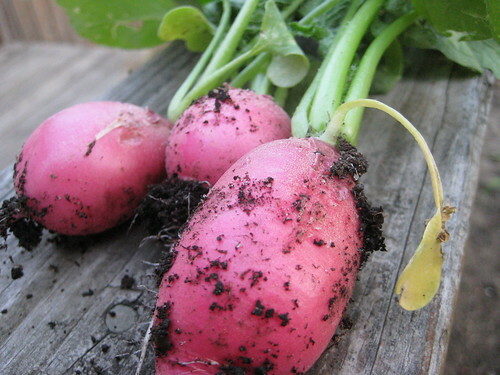 Those radishes I showed the other day were just popping up out of the ground- literally! I picked these three last night. These seeds were free with my order from Rare Seeds, and my Square Foot Gardening book says they do well under tomatoes, cucumbers, etc. Too bad I don't really like radishes. I might try one in my Green Monster tomorrow, or, more likely, give them to my parents!